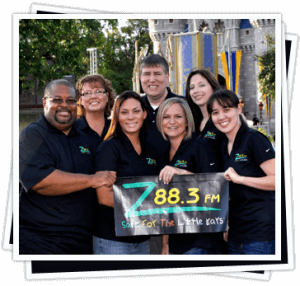 Z88.3 is a small independent Christian broadcaster formed in 1995, operating out of Altamonte Springs, FL and serving the Orlando market of Central Florida. From our studios, we originate four stations – our main station, 88.3, which provides contemporary Christian programming, and three other stations, which play Christian hip-hop, Christian rock, and gospel. We believe in doing one thing and doing it well, so we put our emphasis on our radio personalities and our live music programming. When it comes to technology, we’ve been innovators in our market for a while. We currently have HD2, 3, and 4 stations, we were the first station to have HD multicast online in Central Florida, and we were also the first Christian station in the nation to do HD Multicasting. We’ve always pushed ourselves with regards to technology – sound quality is a major priority for us. Along with pushing technological developments, we’ve also made sure to keep our on-air staff strong. While other conglomerates have been cutting back on staff and shifting to syndicated programming, we’ve kept live programming a priority. Additionally, we’ve been the LP1 weather station for most of the past decade in our area, and we’ve worked to serve our community with regards to weather alerts. We believe that if anybody should serve the community, it should be the Christian station – so we’ve taken that mantra, and run with it. Easy and quick live-calls that sound great are crucial for our programming. Since about 2000, we’ve had an IP based phone system. For call management, I had been working with a 3Com soft phone system, connected to a PC, with a professional sound card, for approximately 8 years. It was never designed to be a call management system, but I was able to program it to work like a studio console, and it provided the best available call quality for us at the time. Unfortunately, support for the software ran out after Windows XP, which triggered my search for a SIP based phone system. STAC VIP had the features I was looking for. I was looking for a solution that was a small SIP based system – the other solutions I found were designed for large conglomerate stations, and I was looking for something that could scale small, and didn’t just use an analog to SIP gateway. I wanted STAC VIP to integrate with our 3Com NBX phone system, which it had never been used with before. Comrex was excellent with supporting us, and getting it to work with our phone system – we teamed up with a few of their software developers to develop some specific adjustments to the code to get the system integrated. The STAC VIP is HD Voice capable, and can accept HD Voice calls from smartphones and codecs, so that callers can sound like in studio guests if necessary with no additional set-up on our end. While we had eliminated our POTS lines completely, the STAC VIP can accommodate the use of those phone lines for stations in transition. Additionally, VOIP lines are significantly less expensive than traditional POTS/ISDN lines. My staff is much more comfortable with the STAC VIP call interface than what they were using before. It’s much more usable for them, and they love that part. General operation is simple – our producers use the web interface and find that helpful. We’ve found it to be a very easy system to use, which has made the live programming vital to our station much simpler. This story was originally published in Radio World. See if STAC VIP is right for you – learn more here.